It has been one heck of a week and I thought life would slow down after graduation 🙂 I got back to Bakersfield on Friday after travelling on work related business and woke up this morning to see the picture of one of our colleagues in the Californian. 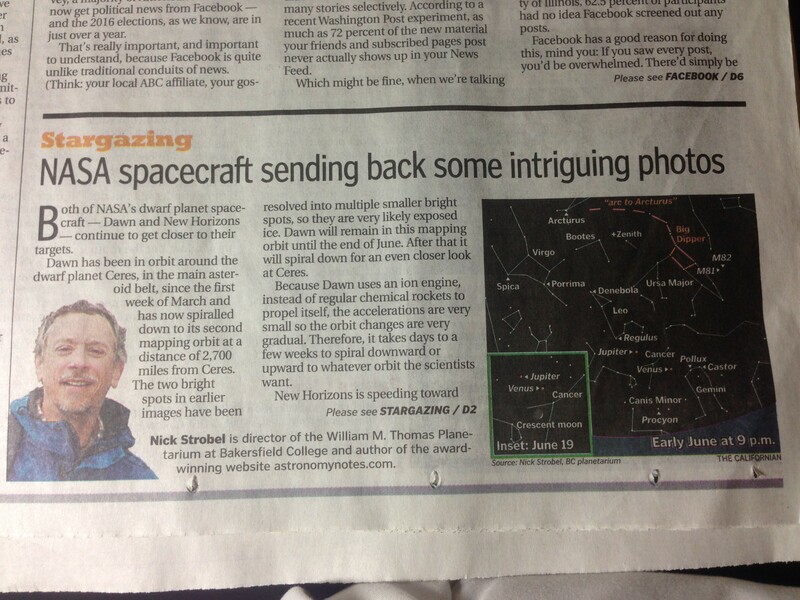 Nick is a regular expert contributor to the Californian with his Stargazing feature, and this morning I was filled with pride to read this well written piece that is content rich and has a nice style. Nick tells us about “Dawn” and “New Horizons,” two spacecraft exploring dwarf planets. He then zooms out to the edge of the universe and the stretching of spacetime with a super-luminous galaxy with 300 trillion times the power of the sun that is visible as it was only 1.3 billion years after the Big Bang. Finally he takes us home for a look at the planets from our familiar night sky, Venus and Jupiter to the west and the rings of Saturn to the east of the evening sky. Here is a “copy and paste” from the website. Both of NASA’s dwarf planet spacecraft continue to get closer to their targets. Dawn has been in orbit around the dwarf planet, Ceres, in the main asteroid belt, since the first week of March and has now spiralled down to its second mapping orbit at a distance of 2700 miles from Ceres. The two bright spots in earlier images have been resolved into multiple smaller bright spots, so they are very likely exposed ice. Dawn will remain in this mapping orbit until the end of June. After that it will spiral down for an even closer look at Ceres. Because Dawn uses an ion engine, instead of regular chemical rockets to propel itself, the accelerations are very small so the orbit changes are very gradual. Therefore, it takes days to a few weeks to spiral downward or upward to whatever orbit the scientists want. New Horizons is speeding toward dwarf planet Pluto at about 750,000 miles a day, so today it is approximately 28 million miles away. You can check its distance up to the minute using the dashboard on the left side of the New Horizons homepage at http://pluto.jhuapl.edu . At the end of May, the images posted on the website were slightly better than the best maps derived from months of heavy computer processing of data from the Hubble Space Telescope. The view over the next few weeks will get thousands of times sharper! In other space exploration news NASA’s Wide-field Infrared Survey Explorer (WISE) has discovered a very distant galaxy, called WISE J224607.57-052635.0, shining with the power output of over 300 trillion suns. Since the galaxy is very distant, we are seeing it as it was 12.5 billion years ago. Because of the stretching of spacetime due to the expansion of universe, I don’t say it is 12.5 billion light years away. At short distances of just a few million light years away, the light travel time matches up with the distance number in light years. For example, a we see a star 150 light years away as it was 150 years ago. But when we’re talking about billions of years of light travel time, then the distance the object is from us at this particular cosmic time is much greater. That’s why the press releases from the astronomers will be careful to give how far back in time we’re viewing something and not give a light years distance number. Having said that, though, I’ll sometimes slip up myself and confuse the light travel time with the distance because my brain is hardwired for Newtonian space and time. Well, the news story about the super-luminous galaxy wasn’t about light travel times or even so much about the large luminosity. The surprising thing is that supermassive black hole at the galaxy’s core that is responsible for the huge power output is so darn young, just 1.3 billion years after the Big Bang. The light is coming from the huge disk of gas and dust spiralling into the black hole. Bigger black holes can have bigger (brighter) disks of gas and dust surrounding them. The black hole at the core of WISE J224607.57-052635.0 was already billions of times the mass of our Sun when the universe was only 10% of its present age. How did it get so big in so short a time? Three months ago in a previous column, I talked about another supermassive black hole that had grown huge in “too short” a time. Well, one can expect a few oddballs to crop up in nature due to chance but the latest study from WISE talks about 20 new very distant galaxies that have been found with have very large black holes that have been added to the oddball list. That’s enough to indicate our understanding about what’s powering these super-luminous galaxies is incomplete or how these black holes grow is incomplete. Probably both are incomplete! Something we do understand very well are the motions of the planets in our sky. The two brightest planets, Venus and Jupiter, continue to draw closer together in the western sky after sunset. Jupiter is still between Cancer and Leo. In May Venus scooted through Gemini and is now on the right (west) side of Cancer about a fist and a half width at arms length from Jupiter (see the first star chart below). On the night of June 19th, a thin Waxing Crescent Moon will be below Jupiter and Venus making a very nice photo opportunity. At the time of the free public star party hosted by the Kern Astronomical Society on the 27th, Jupiter and Venus will be about two knuckles at arms length apart from each other. At the end of the month, they’ll be less than a thumb width apart from each other. Saturn is shining brightly in the eastern sky in the evening. It continues moving retrograde (backward) and is now at the edge of Libra in front of the head of Scorpius (see the second chart below). Saturn’s rings are tipped almost fully open from our perspective on Earth, so this is a good time to check them out in a telescope. ← “Thank You, Mr. Falker” — and Thank You, Mrs. Mitchell’s Class! Thanks for the kind write-up!